NOTE: This method is still experimental. Sleep and CPU power management will never work in Snow Leopard on an Ivy Bridge computer. The main purpose of installing Snow Leopard on Ivy Bridge is to allow you to update to a newer version of Mac OS X later on. If you try this method out yourself, please leave a report in the comments section of this article. Thank you. Ivy Bridge processors have model numbers that are higher than 3000 (for instance, the i5-3450). 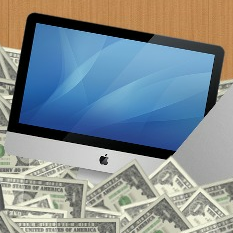 Some Ivy Bridge processors use HD 4000 integrated graphics, which are supported by Mac OS X. 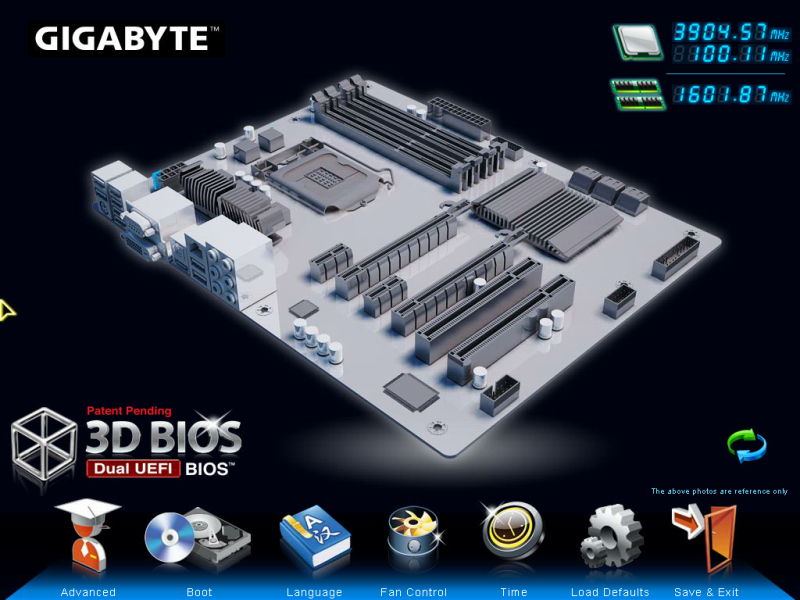 Other Ivy Bridge processors use HD 2500 graphics, which don't work. If your computer has HD 2500 graphics, you will have to buy a separate graphics card for your Hackintosh. To find out whether your Intel processor uses HD 2500 or 4000, you can Google the model of your processor. For example, if I search "i5-3570K" on Google, the first result is Intel's official page for the Intel Core i5-3570K. According to the "Graphics Specifications" section of that page, the i5-3570K processor uses "Intel® HD Graphics 4000". A compatible computer: Not every computer will work with Mac OS X. Be sure to read the Hackintosh compatibility guide very carefully, to check whether or not your computer qualifies. An empty hard drive: You cannot install Mac OS X on a hard drive that already has Windows installed. You need a hard drive without anything important on it, because you will be erasing the entire hard drive. You can override this requirement by using nawcom's ModCD instead of iBoot Ivy Bridge, but I can't guarantee it'll work. Mac OS X Snow Leopard installation DVD ($20): The method used by this guide requires the retail DVD for Mac OS X Snow Leopard. iBoot Ivy Bridge (Free): iBoot Ivy Bridge is a boot CD that allows you to boot the retail Snow Leopard DVD. To burn iBoot Ivy Bridge onto a CD, you need an empty CD and a CD/DVD/Bluray drive that can burn CDs (just about every drive can burn CDs nowadays). The normal version of iBoot will not work for the purposes of this guide; you must use iBoot Ivy Bridge. An extra USB drive: You will need an extra USB drive to store the OS X Mountain Lion kernel on, in Step 1. The size of this USB drive doesn't really matter (the kernel itself is a mere 8 MB in size). Mac OS X 10.6.8 Combo Update (Free - 500 MB): Optional; you can update Mac OS X after you finish the initial installation with iBoot. Your Hackintosh probably won't have internet after your initial installation, so you probably want to download this update onto the extra USB drive. 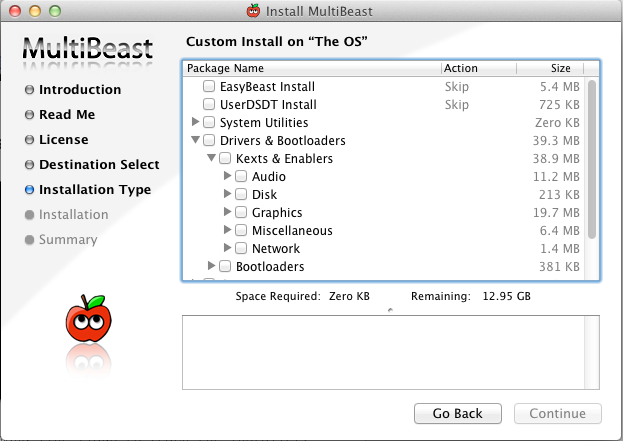 Multibeast Snow Leopard Edition (Free - 22 MB): Multibeast is a collection of kext files that your Hackintosh will need to run properly, after the initial installation. Download it onto a USB drive, along with the combo update. You need to register an account on tonymacx86.com to download Multibeast. Be sure to download the Snow Leopard edition, not the Lion edition. The kernel is an important system file that helps Mac OS X communicate with the hardware on your computer. When you install Mac OS X Snow Leopard on your Ivy Bridge Hackintosh initially, the standard Snow Leopard kernel will not work with your processor. Instead, you will need the standard Mountain Lion kernel, since Mountain Lion supports Ivy Bridge. Attached below is the Mountain Lion kernel. Download this file, and copy it onto a USB drive. Save this USB drive for later. Be sure to follow the standard setup procedures for Hackintoshes. Unplug any extra USB devices, adjust your BIOS settings accordingly, etc. For details, check out Steps 1-2 of our standard Snow Leopard installation guide. If your motherboard uses UEFI instead of BIOS, follow our guide to setting up the UEFI for Hackintoshes instead. Don't know the difference between UEFI and BIOS? UEFI is colorful, has pictures, and allows you to use your mouse. BIOS is generally monochromatic (usually blue or gray), and requires you to use your arrow keys. The procedure for installing Mac OS X Snow Leopard with iBoot Ivy Bridge is the exact same as the normal way to install Snow Leopard on a Hackintosh. For details, simply follow Steps 3-4 of our Snow Leopard installation guide. After you finish the installation, boot into Mac OS X with the help of iBoot Ivy Bridge. Once you've booted into your new installation of Mac OS X, you'll still need to perform the most important step of the process. In this step, you will delete the standard kernel currently located in your Snow Leopard installation, and replace it with the Mountain Lion kernel that you saved in Step 1. 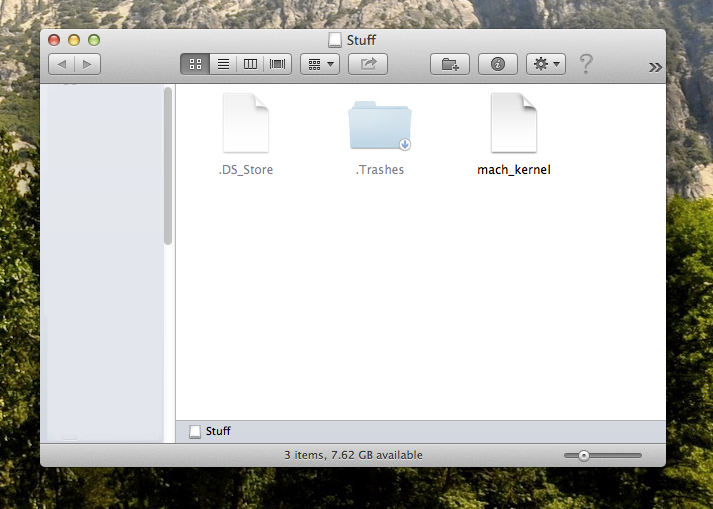 First, enable the showing of hidden files in Mac OS X. Then, go to the hard drive where Snow Leopard is installed. 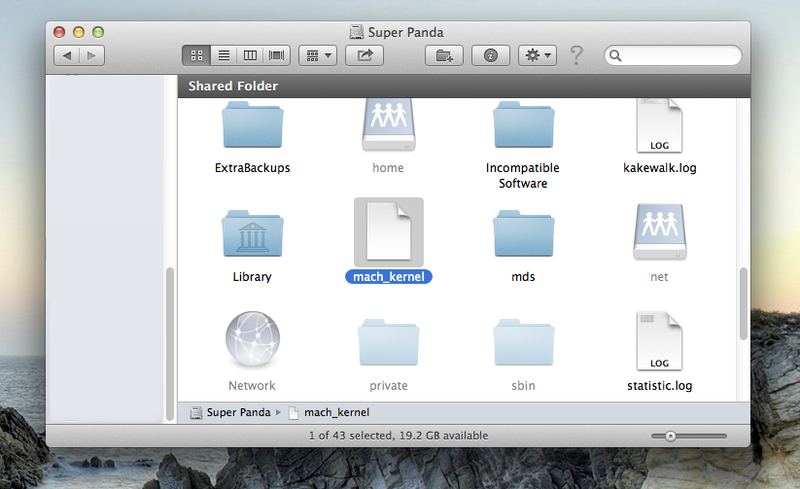 At the very base of the hard drive, there should be a "hidden" (grayed-out) file called "mach_kernel". Delete this file by dragging it into the trash. Plug your USB drive from Step 1 into your Hackintosh. Open the USB drive, and drag the "mach_kernel" file from your USB drive into the base of your hard drive. Congrats, you have successfully replaced the kernel. Now you can update to Mac OS X 10.6.8, to get the Mac App Store. 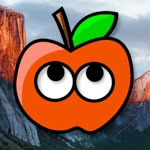 From there, you can download the Mountain Lion installer app, and follow our standard Mountain Lion installation guide to update your Hackintosh to the newest versions of Mac OS X. For more details, check out Step 5 of our Snow Leopard guide. And that's all there is to it. If your PC is built of nothing but Hackintosh-compatible parts (known as "vanilla"), this entire process might only take around 2 hours. Of course, for most of us, this process will take much longer. 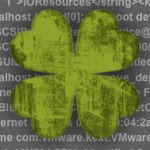 Good luck Hackintoshing!